Louise Ford is a stage and screen actor who is recognised for television roles such as Kate in Channel 4 comedy, Crashing, Nina in In the Flesh, Gracie in Chickens, and Jane in the 2012 film, Fast Girls. 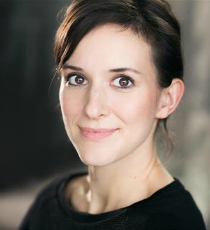 Louise’s stage credits include Orson’s Shadow (Southwark Playhouse), A Midsummer Night’s Dream (Shakespeare’s Globe) and Quartermaine’s Terms (West End). She has also featured in various radio dramas and comedy sketch shows for BBC Radio 4, as well as BBC television series, Horrible Histories. Louise recently played Kate in Channel 4 comedy, The Windsors.